This offer is valid if you buy Advanced System Protector v2.3 before Thursday, April 25, 2019 - so don't miss out on this incredible opportunity. Over 10 million people have already chosen Advanced System Protector! 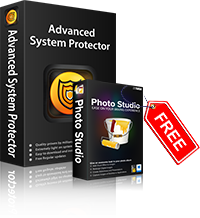 This offer is valid if you buy Advanced System Protector v2.3 before Thursday, April 25, 2019 - so don't miss out on this incredible opportunity.It includes the most comprehensive set of utilities which will keep your PC running smooth, clean and secure. Why do I need Advanced System Protector? If you need protection from cyber criminals, Advanced System Protector is the way to go. This anti-malware program effectively removes spyware, malware and adware from your system and protects it against real time threats. With over 10 million definitions and daily updates, this is the program you need for protection against spyware attacks.This is a one year license and will be billed annually. Remember - 2 minutes of your time could save you months of crashes and frustration by securing your PC from Malware threats with Advanced System Protector!